Eretz Yisrael. The Holy Land. A land uniquely endeared to the Jewish people and to G‑d, as the land "...upon which the eyes of G‑d your G‑d gaze from the beginning of the year until year's end." For hundreds of thousands of Israelis — from the core of the country to the farthest reaches of its borders — month by month, day by day, moment by moment — the work of Chabad profoundly affects the very fabric of daily life in Israel. In Tel Aviv a Russian immigrant spends sleepless nights in his newly won freedom straining to learn a new language, adjusting to new social customs, making friends, worrying over the loneliness of his young children. A woman in an impoverished district, her husband long gone to work, her children out of school and on the streets from 12:30 in the afternoon till bedtime, sits in the 95 degree heat of a three-bedroom apartment that houses her family of eight. On the cool, tiled patio of a villa in Carmiel, a group of professors sip their cocktails, discussing in measured intellectual tones the latest developments in astrophysics research as they await the arrival of the local Chabad rabbi, for their weekly class in chassidic philosophy. A young soldier, spending his first Chanukah away from family and friends, stands a cold, wet guard along the Lebanese border, his bravery and patriotism struggling to combat the numbness in his feet, the emptiness in his heart. These are the people of Israel. From every corner of the world. From every imaginable background and descent; of every economic and social status. Of every level of religious observance from the most religious and chassidic, to the most secular and cynical. Chabad has accomplished what was deemed impossible — to have open channels of communication to them all, to be endeared to all and respected by all. Israel is a country beset with economic struggles, internal factionalism, and a growing materialism that threatens to erode its religious and moral foundations. In the face of this, Chabad provides the hope and idealism so desperately needed for Israel's vitality. Chabad infuses those they touch with joy and pride in the uniqueness of the Jewish people and the holiness of the Land of Israel — so that their life takes on purpose and meaning, transcending the hardships of every day existence. 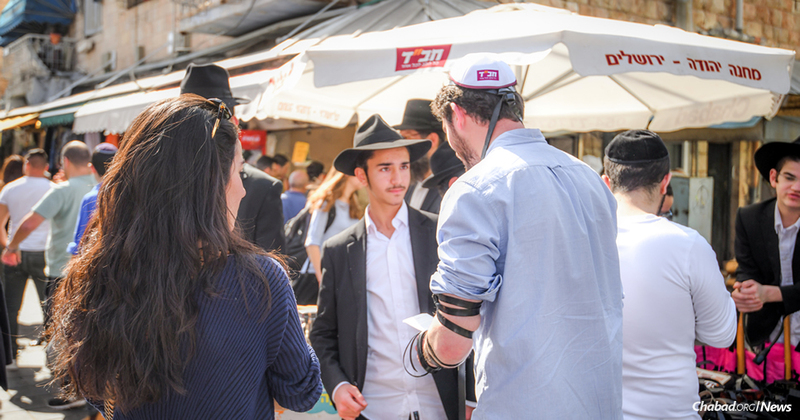 Chabad Houses everywhere hum with a steady flow of people needing help, finding a job, paying a bill, or feeding the family; while others seek religious guidance, a pair of tefillin, or help with their son's bar-mitzvah. The Jews of Israel. All loved and served by Chabad in a thousand ways, every day, and with an overflowing heart. Indeed Lubavitch is accepted by hundreds of thousands as the spiritual heart­beat of the country, and everyone knows "Tzach," the Lubavitch Youth Organization — Chabad's general activities arm. Over 300,000 boys and girls in Israeli cities and villages attend informal weekly classes under the auspices of the Tzivos Hashem organization; 40,000 children participate in day‑camps during the summer vacation; Shabbat afternoon gatherings are conducted weekly in over 300 communities; every year thousands of children gain their first exposure to Judaism by spending a Shabbat in the picturesque chassidic community of Kfar Chabad. 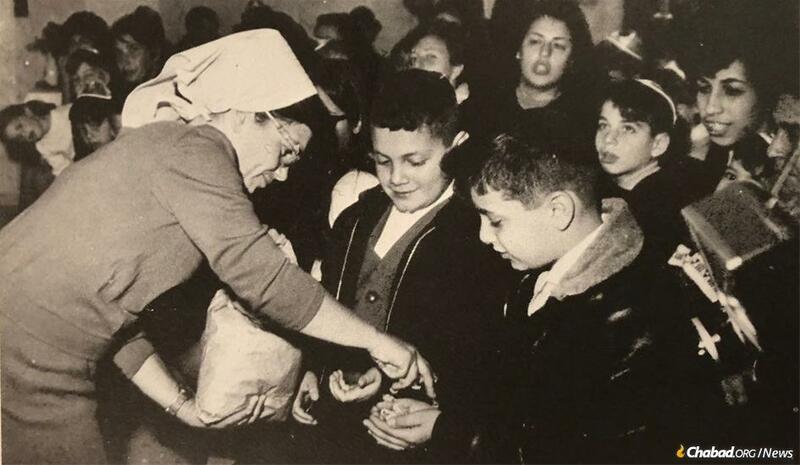 In the pre‑Purim educational campaign, literally tens of thousands of children actively participate in the mitzvah of giving gifts of goodies to friends and total strangers; throughout the following month, fleets of buses converge on the Kfar Chabad village in order to show schools how handmade sh'mura matzo is baked (and this means taking home new learning, new songs, a new Passover Haggada, and a sample of real matzo). To meet the learning needs of this vast array of young people, mobile and conventional libraries lend out books and tapes, and a computer center develops state‑of‑the‑art educational programs. From Nahariyah in the north to Eilat in the south, 130 Chabad Houses serve the adults with open minds and warm hearts. They organize teams of volunteers to check mezuzot, conduct study sessions, make kitchens kosher, distribute Shabbat candles in hospitals, visit and teach the elderly, help in the rehabilitation of prisoners, and the list goes on. 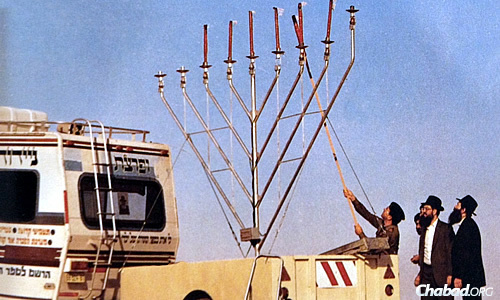 Each festival sparks off a range of public service projects — scores of sukot on wheels, public menorah‑lighting and rallies for Chanukah, megillah‑reading and shallach‑manot distribution on Purim, etc. One of the annual activities peculiar to Eretz Yisrael is the educational program for Tu-B'Shevat, the New Year for Trees, when religious agricultural laws associated with the Holy Land are highlighted. On Lag Ba'Omer, hundreds of colorful parades, involving over a quarter of a million children, take place throughout the country. All of Chabad's educational institutions are qualitatively remarkable. In addition, some are quantitatively outstanding — in terms of enrollment, success-rate, scope and beauty of their buildings and grounds, sophistication of their equipment and front‑line educational technology. 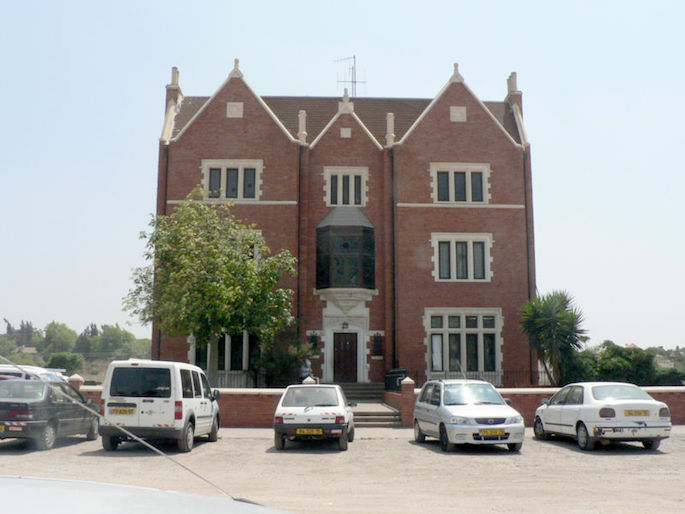 A few examples: The yeshiva called Torat Emet, founded in Hebron in 1912, and today a major institution of higher Torah‑learning in Jerusalem; the great yeshivot of Kfar Chabad, whose academic standards are respected worldwide, and whose senior students often volunteer to spend their rare free Shabbat in a kibbutz where there is neither a kosher kitchen nor a synagogue; the magnificent campus of the girls' high school and seminary complex of Beit Rivka; the forward‑looking vocational schools in Kfar Chabad, offering training in agriculture, carpentry, printing and engineering; the Ascent Institute in Safed, with its English‑language outreach seminars and vibrant publications; Machon Alta, with its intellectually stimulating study programs for women of college age; Shifra and Puah, which recruits teams of teenage girls to cheerfully take over the household tasks of women immediately after childbirth. These and many other institutions have made a major impact upon Israeli society. 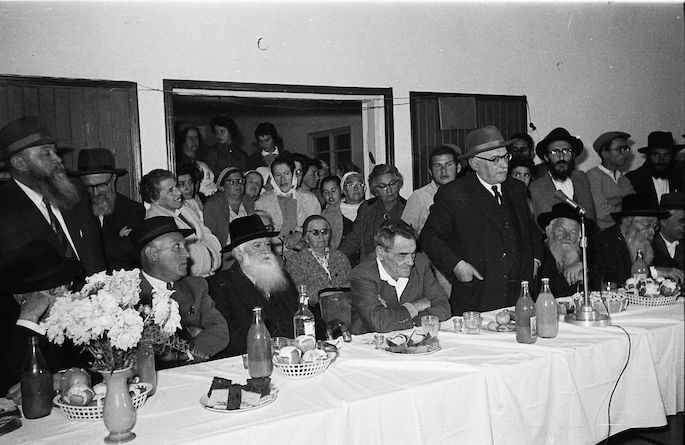 Residents of Kfar Chabad greet President Zalman Shazar in 1963. Kfar Chabad (founded in 1948), Nachalat Har Chabad (1969), Kiryat Chabad (1979) three of the major Chabad towns in the Holy Land serve as the base of many Chabad activities. These towns have its own schools, yeshivot, synagogues and medical centers — as well as textile factories and other industries. The scene had an aura of surrealism. It was the holiest day of the year, Yom Kippur, in the Lubavitch town of Kfar Chabad, in 1973. In the three major shuls, the gentle, yet awe-inspiring, voice of the chazzan could be heard over the hum of praying. A sea of white kittel robes (worn only on this special day), the tallit shawls covering the faces. Here and there a quiet sobbing. The Day of Judgment; the day of supreme self-honesty. Shattering the atmosphere — the raucous diesel engines of army transport trucks, raising clouds of dust as they roared down the deserted roads of the town, and came to stop outside the shul. Invasion. War. Call-up. Shock. The word spread like lightning throughout the sea of worshippers. Pikuach nefesh, danger to life, mandated violation even of Yom Kippur observance. Chassidim began to file out of synagogue and clamber into the trucks, their tallit and kittel removed, but still incongruous in their long black coats. 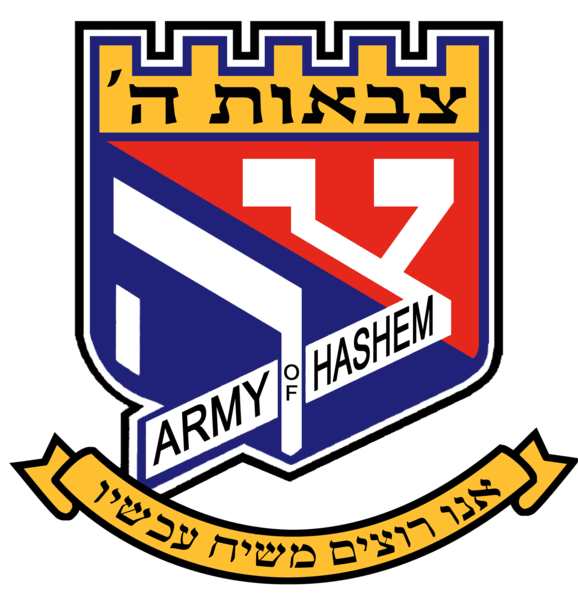 The Lubavitchers were on the way to their units and their posts as part of Israel's army, joining the other defenders of their people, "as one man, with one heart" (Exodus 19.2 Rashi). At an Israeli army base near the Syrian, Jordanian and Lebanese border, circa 1987. The special relationship of Chabad with the Israel Defense Forces is legendary. "Chabadniks" (the affectionate Israeli colloquialism for Lubavitch Chassidim) will tramp through miles of mud to bring Chanuka or Purim cheer to an isolated, desolate army base. 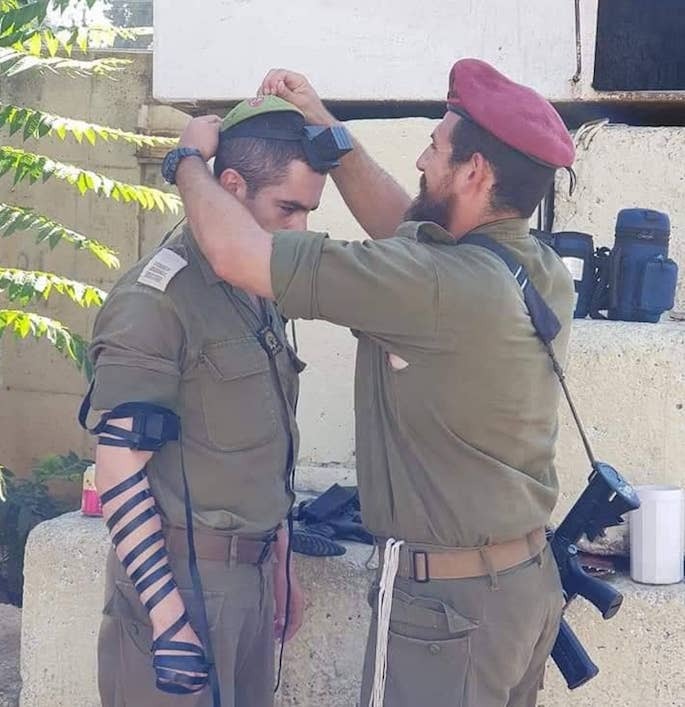 Cherished by the soldiers of Israel, their selflessness and self-sacrifice is seen as a genuine expression of love and unity with these brave men who steadfastly guard our Holy Land. These are not isolated, sporadic visits. Visitation by Chabad takes place on an army-wide scale every Sukot, Chanukah and Purim, and there is a highly-organized program of regular visitation by the "mitzvah‑tanks," which have become famous on the Lebanese front. 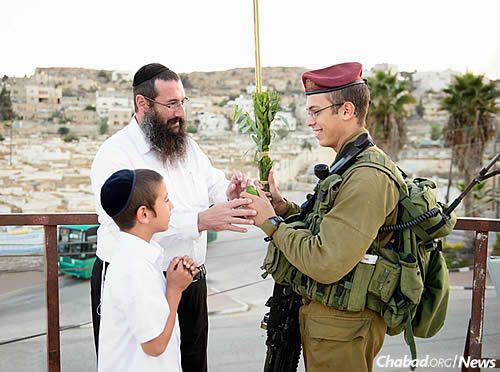 All of which is in addition to the person‑to‑person warmth exuded by the men of Chabad to their buddies, when they serve their tour of duty in the Armed Forces. Shifra Marasow devoted her life to the welfare of war orphans and widows of fallen soldiers in Israel. 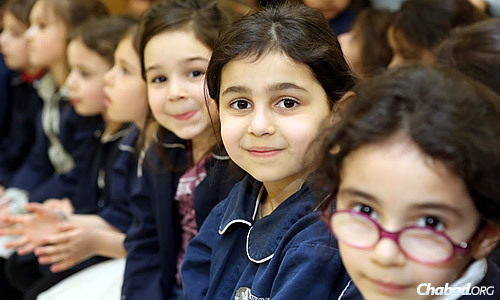 Religiously, Israel is complex; a place where the religious foundations of Judaism are often scorned beneath the proliferation of secular values, and Jewish children can receive little or no traditional Jewish education. In response to this, Chabad has launched a massive campaign of Jewish education to Israel's young. Millions of colorful books, pamphlets, brochures and posters are distributed throughout Israel, urging, instructing, and inspiring Israeli children to the proper observance of holidays and mitzvot. The leaders of Chabad Lubavitch were actively involved in settlement of the Holy Land, as long ago as two hundred years. From 1776 onward, they raised funds throughout Europe to aid the economically beleaguered inhabitants of Israel. The oldest Jewish charitable organization in the Holy Land is Kolel Chabad, founded in 1788 by Rabbi Schneur Zalman of Liadi (1745-1812), first leader of the movement, and continuously active since that time, Kolel Chabad treats Israel's needy as if they were their own brothers and sisters. At the subsidized supermarkets run by this unique humanitarian organization, the poor maintain their self-esteem by buying the food, not taking outright charity. The elderly homeless avail themselves of free daily hot meals at Kolel Chabad's soup kitchens, while other low-income families receive a variety of social and humanitarian services, including free heaters installed in their meager apartments, and assistance with heating bills. 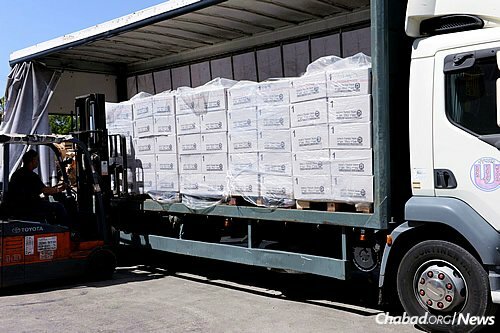 Kolel Chabad provides temporary apartments, food and utensils, and many other services to newly-arrived Russian immigrants, and sponsors Russian-language literature for these spiritually impoverished families. The organization heads a nationwide program of hospital visitation for children, particularly during the festival seasons. For example, during Chanukah, Kolel Chabad is famous for turning up in the wards of chronically ill children, with gifts, clowns and hot potato-latkes.